One of the gardener’s worst nightmares is to find that their most precious young plants have been devoured overnight by snails and slugs. These pests are a perennial problem, as both snails and slugs produce large quantities of eggs which even harsh winters may fail to kill. They also love wet conditions. 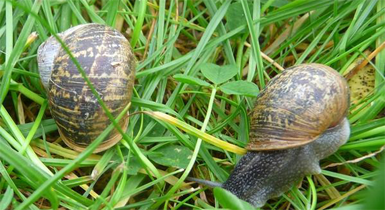 To get rid of snails and slugs completely is impossible, but there are, nonetheless, tried and tested methods of controlling these troublesome creatures. Minimising snail and slug damage in the new garden When you are planning a garden, be aware that stone and brick walls are habitats loved by molluscs with and without shells. If you have any such walls in the garden, snails and slugs will cluster there in large numbers. Do not think that siting your vegetable patch at the opposite side of a large garden will help, because these trouble-makers will make their way over surprisingly quickly. There are some plants which gastropods do not like to eat, notably those which are hairy, bitter or fragrant. Lavenders, for example, will not be attacked and neither will roses or pelargoniums. Other slug-resistant plants include lady’s mantle, aguilegias and fuchsias. 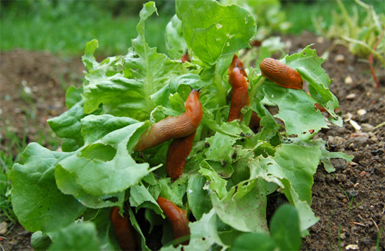 How to get rid of snails and slugs from the vegetable garden These pests love succulent young growth, which makes young lettuces, beans and courgettes very susceptible. You can scatter chemical slugs pellets around your young plants, though be aware that some of these are harmful to birds, other wildlife and domestic pets. They are best used sparingly and as a last resort. Alternative barriers to keep snails away from vulnerable plants are sharp materials such as gravel, or copper rings, which give the slimey pests an electric shock. However barrier methods are less successful with slugs, the majority of which attack from below the soil. An organic method of controlling these is the nemotode worm. Although very reliable in getting rid of the very destructive small black slugs, it is an expensive method to use for more than a small area of ground. Attracting natural predators Frogs, newts, hedgehogs and some birds will all enjoy a meal of juicy molluscs. If you provide the habitat they need, they are your best allays in the battle to get rid of snails and slugs from your garden. Make your garden into a wildlife-friendly area by creating a pond or bog-garden where amphibians can drink and shelter, plus a woodpile and compost heap where hedgehogs can nest. If you are doing this though, do not also use pesticides, as they can kill the very creatures you are trying to attract.